The cake picked for this month's bake with The Cake Slice Bakers was Old-Fashioned Pound Cake from the chosen book of the year, "Great Cakes" by Carole Walter. I knew that I didn't want to make a simple pound cake so I was thinking of an alternative way to present the cake. Then I saw that I had some swiss meringue buttercream left from frosting another cake, and I thought, why not cupcakes? So I made cupcakes with this recipe, and this was the result. To make the cakes, I started by creaming butter with sugar until the mixture turned light and fluffy. To this, I added the eggs, one at a time and beat each egg thoroughly into the batter. In the meantime, I sifted the flour with the baking powder and salt. This was added in 2 batches to the egg batter which by now looked like it had curdled big time. Don't worry, everything will be okay. Finally, I added the vanilla extract and milk, and the result was a thick and pale batter. I dished the batter into cupcake liners, and baked them. Once cooled, I dug a hole in each cupcake and filled the cuppies with lemon curd. Finally, I frosted the cupcakes with the buttercream, and that was it! Position rack in the lower half of the oven. Preheat oven to 170C and butter a loaf pan and line it with parchment paper. Dust with all-purpose flour and tap it to remove the excess over your kitchen sink. Sift together the flour, baking powder and salt. Set aside. Cut the butter into 1 inch pieces and place in the large bowl of an electric mixer fitted with beaters. Soften at low speed. Increase the speed to medium-high and cream until smooth and light in colour for about 1.5 to 2 minutes. Add the sugar, 1 tbsp at a time, taking 6 to 8 minutes to blend well. Scrape the sides of the bowl occasionally. Add the eggs, 1 at a time at 1 minute intervals. Scrape the sides of the bowl again. Blend in the vanilla extract. The mixture may appear somewhat curdled but will smooth out when the flour is added. Reduce the mixer speed to low. Add the dry ingredients alternately with the liquid, dividing the liquid into 2 parts, starting and ending with the flour. Mix only until incorporated after each addition. Scrape the sides of the bowl occasionally. Spoon the batter into the prepared pan(s) and smooth the surface with the back of a tablespoon or spatula. Bake in the oven for about 65 to 70 minutes or until the cake is golden brown on top and begin to come away. If it browns too quickly, tent it with foil on top. (I baked the cupcakes for 18-20 minutes). Remove the cake from the oven and place it on a rack to cool for 10 to 15 minutes. Invert the cake onto the rack and remove the pan. Turn the cake top side up onto another cake rack to let it cool completely. 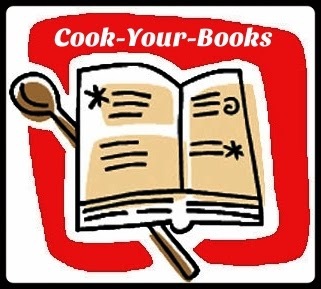 I am also sharing this with Cook-Your-Books hosted by Kitchen Flavours. Gorgeous cupcakes! I love the idea of pairing this up with lemon curd! Mmmm! Beautiful and delicious looking cupcakes! The lemon curd sounds good as the filling! What adorable cupcakes! I like the idea of filling the cake with some lemon curd. And the frosting job is amazing! 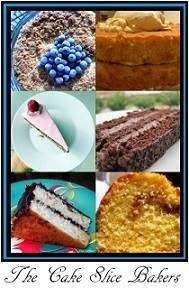 That's a great idea to showcase your pound cake, I love it! Diana, I'm visiting from 'From My Sweetheart' and the Cake Slice Bakers. These cupcakes look delicious ... love the lemon curd in side. Pinning this! Love your cupcakes! Tasty and beautiful! !